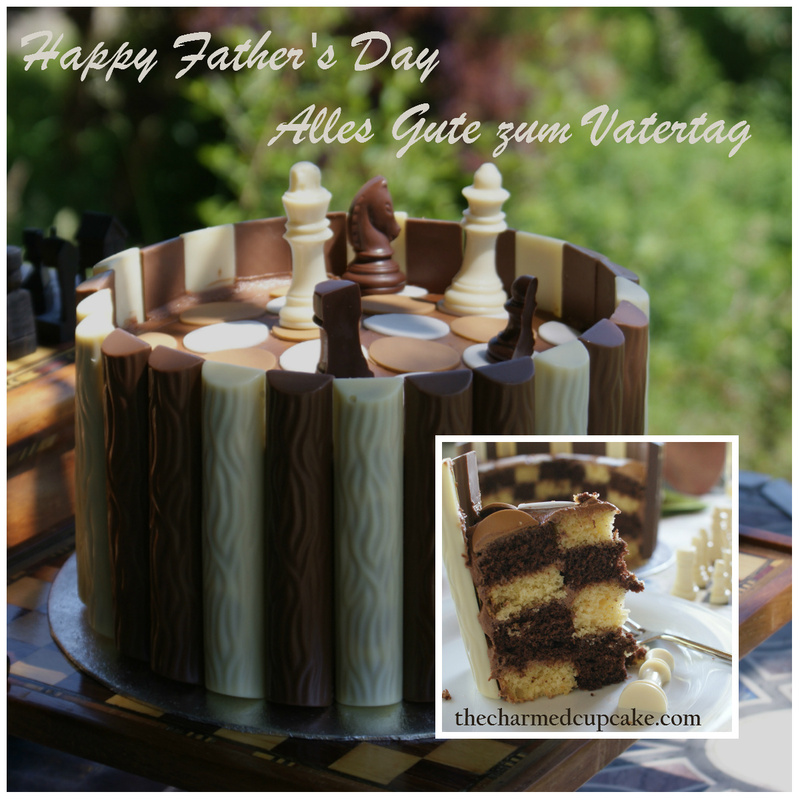 Last week we celebrated Father’s Day known as ‘Vatertag’ here in Austria. 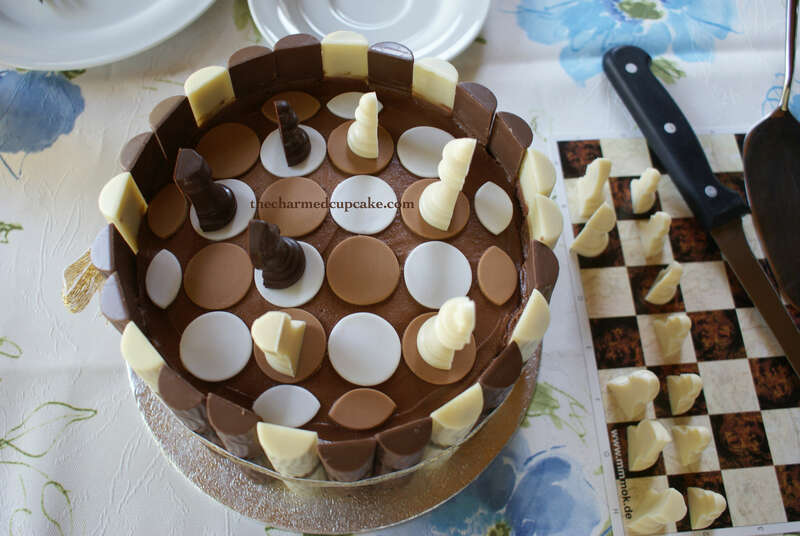 As my dear daddy lives all the way in Australia and me in Austria, I unfortunately could not share this cake with him as like my father-in-law, he too loves to play chess and eat chocolate. This coming Sunday is Father’s Day in other parts of the world and in Australia it falls in September. I thought I would post this now to give you some ideas of what you can easily whip up for your dad. 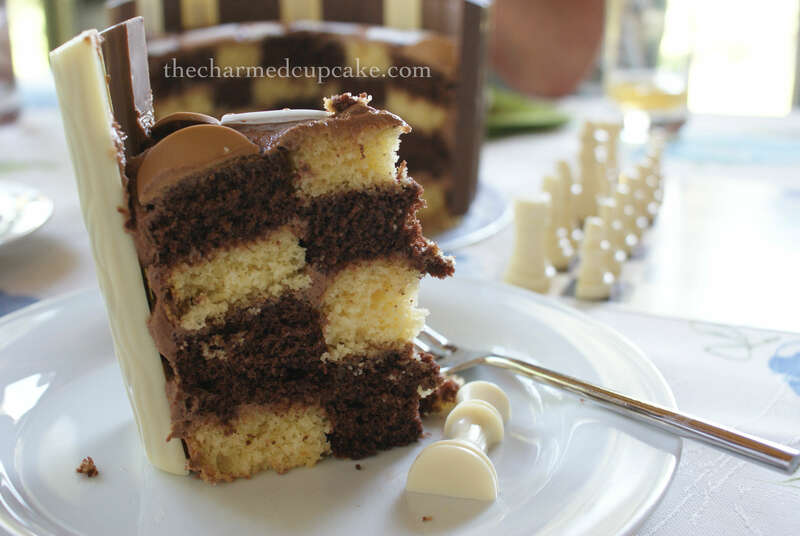 I baked this chess cake for my father-in-law and it was the same easy recipe and principle as the square chess cake I baked here (tutorial on how to cut and assemble the cake). No need for smooth and fancy frosting decoration, just unwrap chocolate fingers and stick them onto the cake to create an impressive border. Here I used white and milk Duplo chocolate. 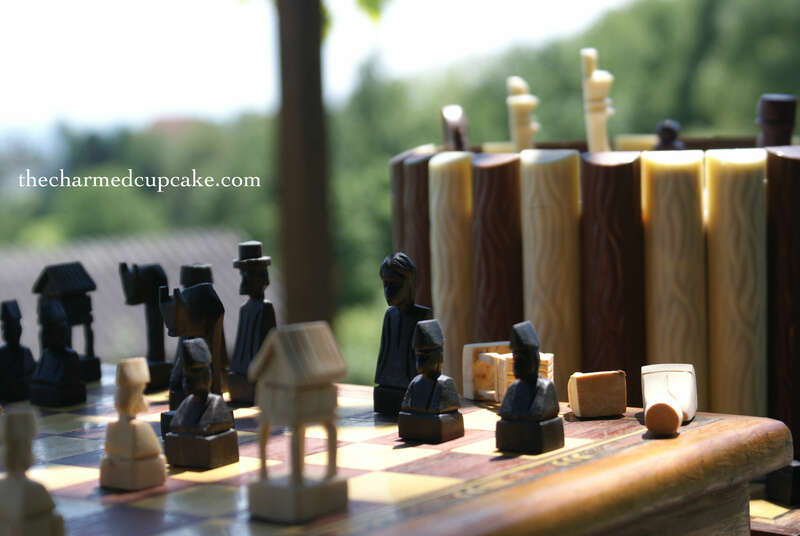 The chess pieces are made of chocolate so you can literally eat your opponent. I ordered them online from Euro Schach (they are based in Germany but send them an email in English if you have any questions: info@euroschach.de). 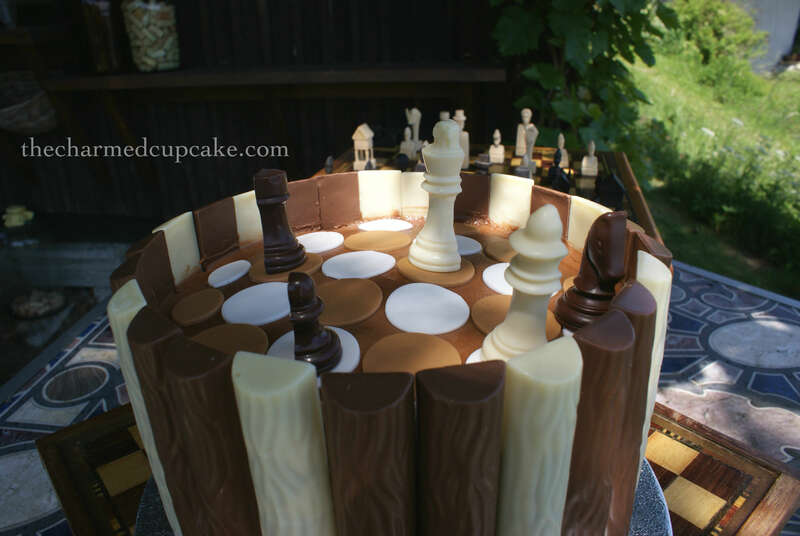 I had to tell my husband to let his father win so that my father-in-law could have his share of chocolate as my husband is a chess shark. 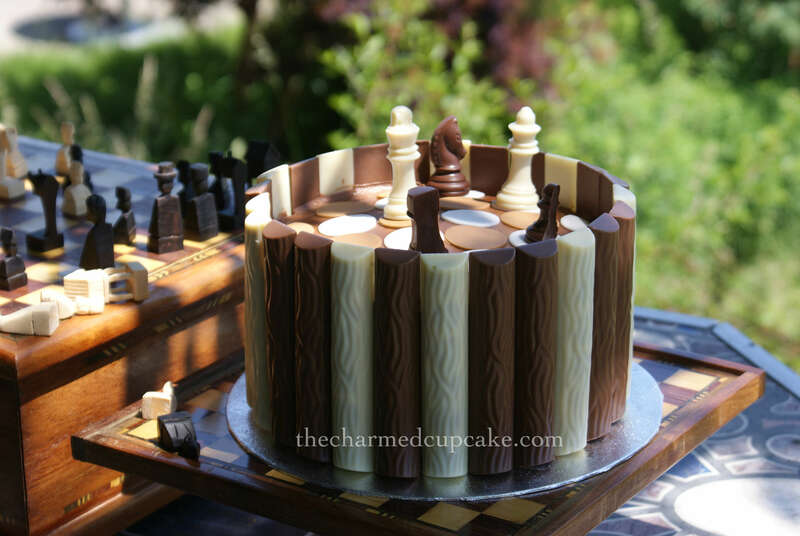 As you can see from the photo below the chocolate chess pieces also come with a chess board so it also makes for a great gift idea. 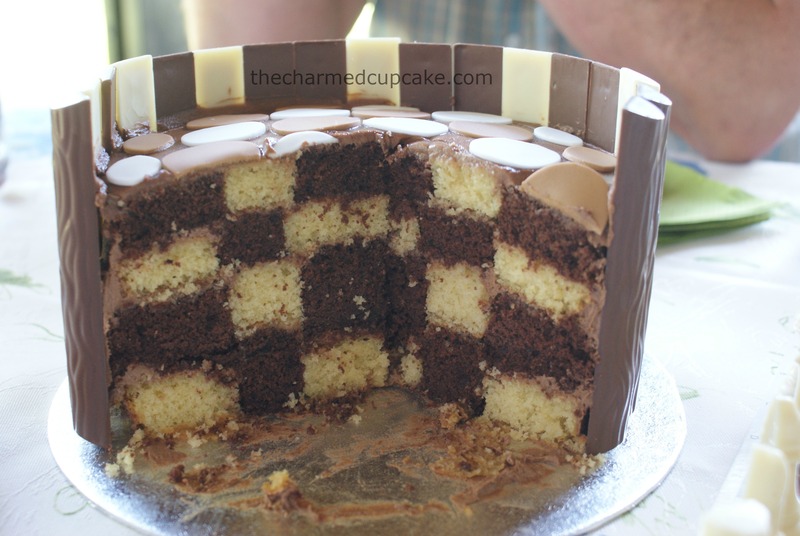 I finally managed to get a better photo of the checkered cake and have a slice too. As soon as we cut into the cake everyone was surprised that the inside was checkered too, there was a lot of ‘OoOOoh’ and ‘WOW!’. Everyone was in awe as to how the checkered effect was baked 😉 it’s a lot easier than one thinks. Be sure to check it our here for the technique. I’m sorry I am not able to spend this day with you Dad. But guess what? I am sending you lots of hugs and kisses. JugendSchach Magazine 2014 April issue. Incredible attention to detail and great fondant cutting skills. Beautiful work, what a special Father’s Day treat!